"Berlin was an island, cut off from the world, but big enough to get lost in as well. Each layer of the Berlin myth seemed to reflect something in the Bowie persona - the Expressionist artists; the cabaret decadence; the cataclysmic destruction; the isolation behind the Wall; the Cold War depression; the ghosts who never depart. Above all, Berlin wasn't quite real. Its military zones, the bullet-holes still pockmarking the edifices, the watchtowers, Speer's megalithic relics, the bombed out buildings next to shiny new ones, the huge black tanks that rumbled along the streets... As Tony Visconti put it, "You could have been on the set of The Prisoner"." Low is a kaleidoscope in which Bowie's obsessions and traits explode into fragments and reform in a new pattern. Sonically, it is hugely adventurous: combining a driving rhythm section with the experimental soundscapes of Brian Eno, it evolves a whole new musical language. Thematically, it's the sound of a man struggling to get well. Bowie has often talked about his fear of insanity. Despite - or because of - this, he drugged himself into a state that looked very much like schizophrenia, and then recorded an album that structurally reflected the illness. Hugo Wilcken is a Paris-based, Australian-born writer and translator. His second novel, Colony, will be published in 2006. Jumpin Jesus on a pogo stick - I've been waiting for this one! Thanks for the heads up. Just read and thoroughly enjoyed this. 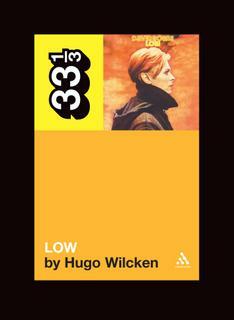 There is lots of background info on LOW I've never seen elsewhere, as well as a discussion of Bowie's life and influences during this period. The book starts - as it should - with some detailed background info on STATION TO STATION (and THE MAN WHO FELL TO EARTH) which adds useful context. In fact, my only disappointment is that it ends with LOW's release - I'd love to see a book dedicated to LOW's sister record, "HEROES", next! Great background information, even for someone who follows bowie for 30 years, there's a lot of new information. Correction for the 2nd printing: The novelist of "the man who fell to earth" is Walter TEVIS not Walter Travis [page 127].